CONICET researcher analyzes the situation of this valuable crop for producers in Argentina. There are as many production benefits as ways of consuming garbanzo beans: in stews, soups, mashed or flour, etc. this crop is one of the most important winter pulses in the world and ranks third after the bean and pea. From west Asia, this crop began to spread through southwest Asia, the Mediterranean area and Ethiopia. There are remains that show that its production dates back to more than ten thousand years ago. Nevertheless, the chickpea arrived in Argentina several years later during the colonial America through the Society of Jesus in Cruz del Eje, in the province of Córdoba and then it spread in the northern region of the country. “There are between 10 and 11 millions of hectares of garbanzo beans that are cultivated in the world. At first, there were small producers in Tucumán but then this crop began to be grown in Córdoba and last year 80 thousand hectares were produced. The garbanzo bean is planted in Córdoba but now most of this crop is concentrated in the north, in Salta and Tucumán”, Daniel Ploper describes. He is an independent researcher of the CONICET at the Instituto de Tecnología Agroindustrial del Noroeste Argentino [Institute of Agro-Industrial Technology of Northwestern Argentina] (ITANOA, CONICET-EEAOC). 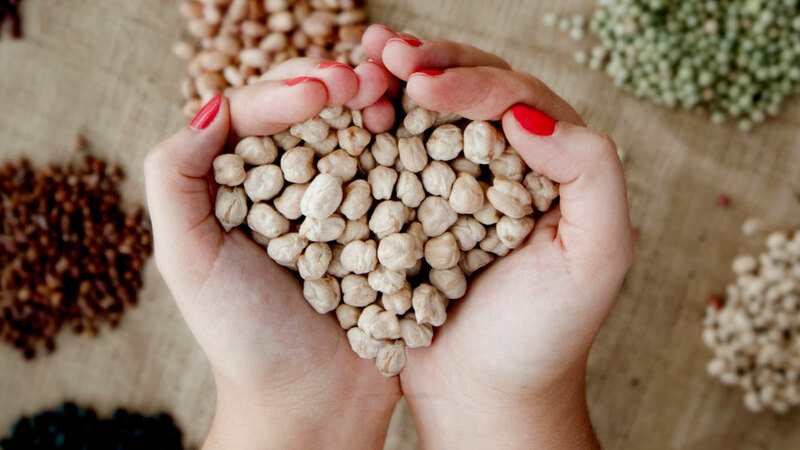 As most pulses, the chickpea has several nutritional benefits. Its incorporation in a diet provides a number of vitamins – B1, B2, B6, B9, C, E and K-, minerals – iron, magnesium, potassium, phosphorous, zinc and calcium-; fiber and protein, with a protein content between 22 and 28 percent. However, despite these characteristics, the researcher explains that historically the cultivation of this pulse was not important until 2004, when it began to increase its international price. This was due to the ignorance of the use of this bean as food. Currently, the internal consumption represents only 8 percent of the total consumption of pulses. “In Argentina, people do not eat pulses despite the fact that they are a staple component of the Latin-American diet, from Mexico to Chile, where people consume them almost daily. In our country, the food habit is more directed towards meat to provide the body with proteins. The problem is that the advance of this crop is delayed because there is no suitable variety available, it is necessary to have technological support in testing varieties and agronomy because some varieties do not adapt to the region”, Ploper comments. As regards that last issue, the agronomist explains that the Estación Experimental Agro-Industrial Obispo Colombres (EEAOC), his workplace, has a programme for research and development of dried pulses. This initiative includes genetic improvement, the assessment of agronomic technology and the health of pulses’ crops such as beans, chickpea, and lentil. Since the end of the seventies, the researchers have studied beans and found several varieties of the black, red and white beans and the cranberry and garbanzo. A programme of this type can produce its own varieties or introduce the ones from other countries, and evaluate them in different environments so as to recommend or sell them. Ploper comments that for many years, the researchers have introduced and tested varieties from the Centro Internacional de Agricultura Tropical (CIAT) in Colombia, but now it is possible to develop varieties locally. In the case of the chickpea, the scientists introduced several varieties of the International Center For Agricultural Research In The Dry Areas (ICARDA) in Siria and began to test them in order to adapt them to the region. The studies led to the registration of two kabuli type beans called TUC 403 and TUC 464. There are two types of chickpea: the desi and the kabuli and the latter is the most spread in Argentina. In 2002 and 2007, these varieties were assessed, and in 2009 they were tested in terms of performance. Currently, more tests are being conducted so as to commercialize it. “When we begin an improvement programme, we seek to find varieties adapted to a good agronomic performance and resistant to main diseases. But we are mainly interested in performance and adaptation. From the crossing between parents, we aim to find the best genotypes in the descendants. Being resistant to diseases is important because they limit the crop and some can lead to losses of 100 percent. Despite the fact that the crossings between plants involve the genetic modification of the descendants, such as it happens with nature, this does not imply a transgenesis, or what is commonly known as the process to obtain a “genetically modified organism (GMO)”, the researcher describes. In the case of the bean, the most common diseases are the mosaic virus and dwarf mosaic, which are transmitted through the aleyrodidae, the whitefly and can destroy 100 percent of the plantations. Other diseases included in the list are common blight and others such as leaf spots and web blight. As regards the chickpea, the main pathologies are scab, and ascochyta blight caused by Ascochyta fungus and transmitted through seed. Pulses crop and specially the chickpea has become more and more important for NOA producers due to the price per grain and as an alternative to include it in crop rotation because it is a winter crop (it is planted between April and May and harvested in October). It is sowed after the summer ones, such as corn or soybeans. Furthermore, that region has monsoon rainfall in summer and it is dry in winter, resulting in good grain harvests. Currently, the varieties of pulses developed by the EEAOC are commercialized by a private company and can be obtained by producers. “We aim to supply producers in Tucumán with efficient alternatives, such as the chickpea”, Ploper concludes.